Standing opposite an arch commemorating Italy’s liberation from fascism at the end of the World War Two, a group of men dressed in black are huddled beneath a gazebo. They’re supporters of Casa Pound – a fringe political party that claims to be inspired by the poet Ezra Pound. Massimo Trefiletti proudly proclaims himself and his party as fascists. The irony of standing opposite a monument to their defeat doesn’t escape him. Mr Trefiletti says 25 April 1945 isn’t a day of national pride but of loss. As for the future, he wants Italy to turn its back on the EU, close its borders and deport all the immigrants. 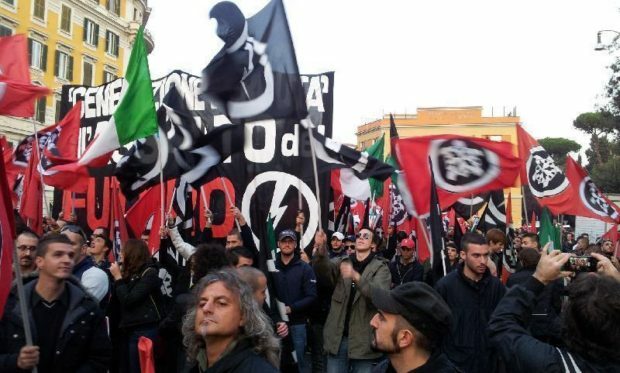 Casa Pound is supported by a tiny minority of Italians but its nationalist, anti-immigrant rhetoric is being echoed by other parties in the run-up to the country’s general election on 4 March.